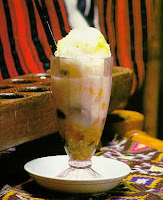 Halo-halo was featured as a Quickfire Challenge dish in the seventh episode of the fourth season of the American reality television series Top Chef. Video game Dead or Alive 4 secret character Nicole lists this food as her favorite, which is probably a pun on the Halo video game universe she is from. The Black Eyed Peas make a reference to halo-halo in their song, "Mare", taken from their fifth studio album, The E.N.D..